Congratulations to Dr Peter Wutchak and the team at the Collie River Valley Medical Centre for the opening of the extension of their existing practice…! Dr Wutchak’s wife, Tanya contacted us after seeing our work at Australind Dental. The plan was to expand into the building next to the existing practice. This would not only add to their existing general practice, but accommodate other allied health practitioners for the town. Patients would often have to travel to Bunbury or Perth for these services and the aim was to offer everything in one location. So, we took the opportunity to get out of the city (don’t get me wrong I love Perth, but am a country girl at heart…!) and met up with the good doctor, his partner, Jan and their wives to run through their wish list. The building was 280sqm and being used as retail space. It was separated from the existing practice by a covered walkway. 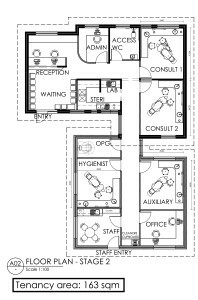 The layout of the existing procedure and nurses rooms worked really well, so the doctors were keen to recreate this in the new space, with consult rooms, a staff/training room, reception and waiting area positioned around them. 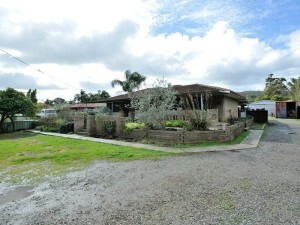 The space easily accommodated all of their requirements including new toilets (including disabled), storage and shower. 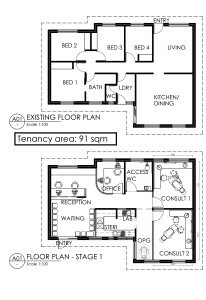 So the planning was completed and some initial pricing obtained from local builders. The final design was completed taking inspiration from the recently design graphics and logo. After a couple of meetings in Collie and a couple in Perth, we were all ready to go. 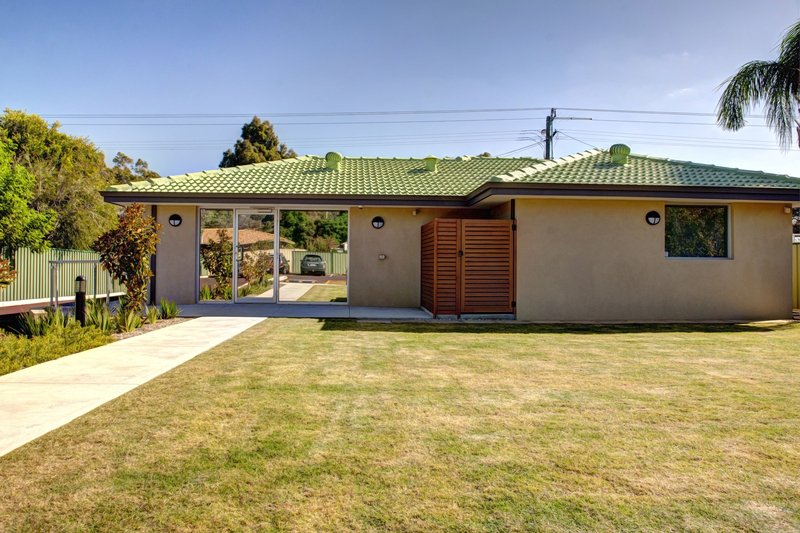 The builder was selected and council approval obtained – construction began. As is the case with a lot of commercial fitout work, there were a couple of minor hiccups. As demolition started, asbestos was discovered in the ceiling – fantastic… Also, we selected a really nice feature paint colour from an obscure Dulux range which was impossible to transfer onto the colourback glass splashback. This was easily sorted out by going to the glass company and colour matching to one of their ranges – PHEW! However, Jeff from White Building and Co. took things in his stride and, with minimal discussions with us created a fabulous space that will take Collie River Valley Medical Centre successfully into a new era of allied health. All in all a very successful project with a great opening party the other night! Tendering – why wouldn’t you…? When I started my first position as a fresh faced interior designer 15 years ago, the construction for all of our projects were tendered. Then, as the economy improved, clients moved towards the attitude of ‘I just want it done’ leading to the Design/Construct model. However, I’ve always wondered ‘why wouldn’t you get more than one quote…?’ Why would you be dictated to by one builder? After all, I tend to check out prices from two or three different shops when spending $1000 – surely you’d do the same if you were investing a couple hundred thousand (often more)…? However, things have changed. People are a lot more cautious since the GFC hit. We recommend going through a tender process for 90% of our projects. After all, you still need to wait for one price, it doesn’t take any longer to get three. But what does that actually mean? How should a tender work? 1. Get three or four different builders to tender – more than that gets a bit unweildy. 2. Ensure that the builders are independant of your designer/architect to prevent any ‘topping up’ of design fees within the construction contract. The designer should be your (the Clients) advocate, not being dictated to by the builder. 3. Ensure the builders are independant of each other to prevent collusion. In small niche markets builders often get quotes from the same subcontractor, but they often get quotes from a number of subcontractors to ensure they prices are competitive. 4. You should be advised how your tender will be run and what the person running the tender will do during the process. 5. We recommend that each builder organise a meeting onsite with all his subcontractors during the tender period – this is a good opportunity for our Clients to meet each builder and see them in action (ie how they deal with their subcontractors, know the project, understand the site etc). As much as the final price is important it is also essential that you are comfortable with the builder. 6. The tenders should all be submitted by a certain time (again to prevent collusion) and should be sent to both you (the Client) and whoever is running the tender (ie the designer) at the same time. We generally try to schedule a meeting with our Client soon after the tenders are submitted to run through each price and any queries or concerns. 7. After the tender it is important to remember that some negotiations may still be required and you may choose to discuss these options with (we recommend) two of your preferred builders. 8. You must feel comfortable with your decision and not forced or frightened into signing up with a particular builder. So, that’s it in a nut shell! Would love to hear your thoughts on the whole process – feel free to comment or if you prefer, send me an email…! Posted by Natasha Posted in Ego Squared projects, Uncategorized | Comments Off on Tendering – why wouldn’t you…? Our client, Dr Patrick O’Rourke, got back from holidays earlier this week to a brand new, fabulous practice! It’s often a very difficult time of year to fitout, but the wait has been worth it! It has been great working with Dr O’Rourke – the entire project designed via email and phone conversations. Anthony made one trip to Noosa once the design was complete to meet with the trades and make sure that there were no unexpected surprises (as the practice was going into a new building). 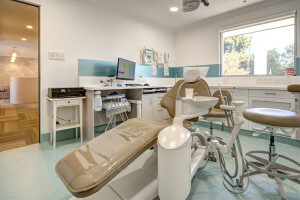 Congratulations to Brett and the team at Dentifit who constructed the project. Ah carparking – the thorn on the rose that is surgery design… Lol;-)! I never imagined that I would have to be involved in carparking layouts when I studied ‘interior’ design! Anyway, there it is! Parking requirements are under your local council authority in Australia and each council has their own interpretation of the guidelines. Dental surgeries often require relatively hefty numbers of bays. 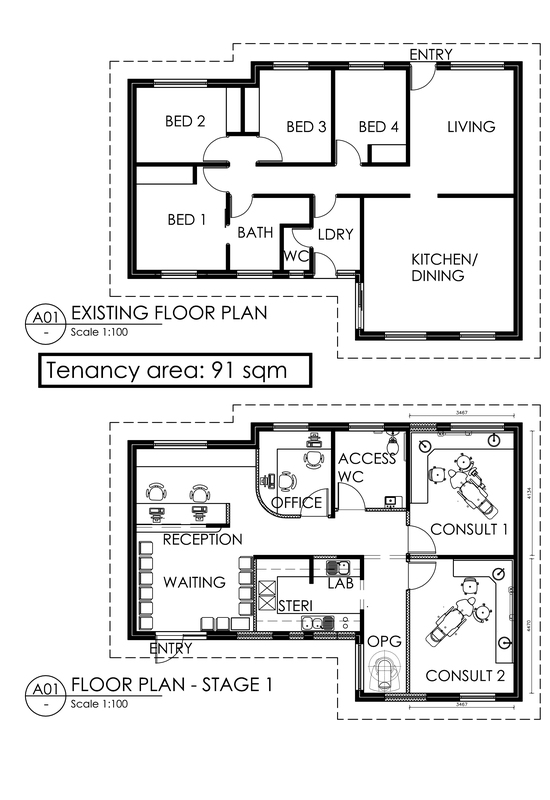 I’ve just completed a floorplan and carparking layout for a change of use from residential to medical/consulting rooms. 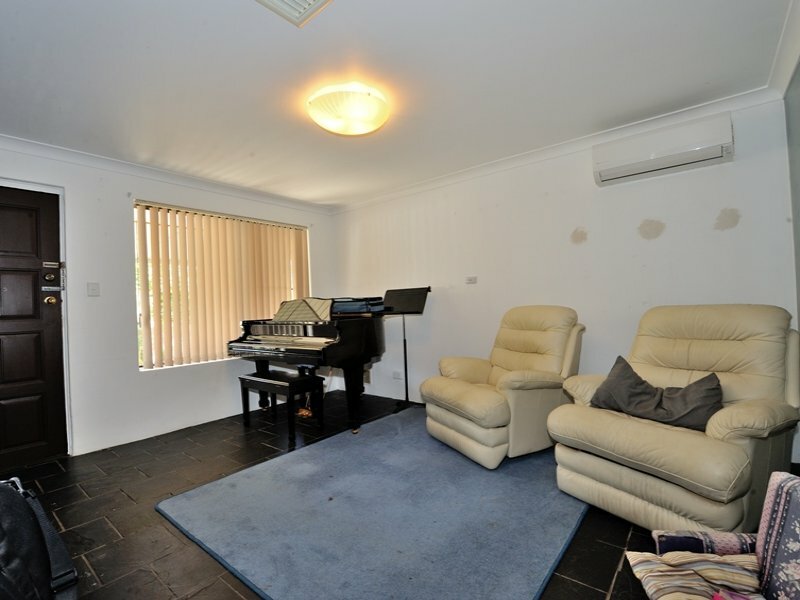 It is an existing two storey house – both floors are 130sqm. The lower floor will have four surgeries and upstairs will be sub leased as offices. And another didn’t require any parking as part of the submission as the space was part of an existing medical centre. Yet another required 13 bays but we could only fit six… The council took into account that there was a shopping centre and a bus station across the road, but I think their was some money paid in leiu to the council. So, as you can see each council is different – give them a call if you are looking at new premises! I would love to hear about you carparking experiences – leave a comment! It was a tough decision – this tank had been a passion since we designed it four years ago (not to mention the tank from the before the redesign). But priorities change, right? His focus was been becoming more about family, more about ‘work/life’ balance. So where do we come in? I think our client didn’t know who else to call that could possibly understand his dilemma – who better but the designers who created the centerpiece in the first place! We assured him that we weren’t offended that he was removing part of our original design and that we could come up with a replacement design to dress up the soon to be empty corner if he so desired. I called him a couple of days later and the decision had been made – the tank was going. So now all we have to do is come up with something fabulous and interesting to look at for that soon to be bare corner – let the creativity commence! When starting a new practice or moving into new premises it is important to take into account local council requirements (not to mention, how long these applications take). The process is different in each state and each council individually interpret the guidelines and also have their own priorities and areas they target. I thought I would take this opportunity to select a number of our latest projects and highlight each of their experiences with local councils. As I started writing, I realized how complex this topic is, so have decided to break it down into a posst per project. Description: Council initially requested six parking bays including one disabled bay (three bays per practitioner). Our client requested a total of eight bays as we had plenty of room at the rear of the property. After submission, council requested the majority of parking to be at the front of the house. As this was not possible, council allowed us to cross over the front boundary slightly giving us three bays out the front (including one disabled bay) and five out the back. As we got closer to achieving the approval, council suddenly requested an extra two bays (five bays per room) – lucky we had plenty of room! I would love to hear your experiences – feel free to leave a comment! Queensland – here we come! We are currently working with dentist in Queensland on his brand new practice. This weekend we are taking the opportunity to escape the rain here in Perth … I mean, see the site and meet our client IRL…hehehe! Some clients are a little concerned about having a long distant relationship with their designer, but infact we quite enjoy working this way! Well, I look forward to bringing you some more info on the Queensland project later in the week! Posted by Natasha Posted in Ego Squared projects | Comments Off on Queensland – here we come! Secret Harbour Dental – not so secret! As promised, some more pictures of our work! Posted by Natasha Posted in Ego Squared projects | Comments Off on Secret Harbour Dental – not so secret! Well, it’s been over a month since my last post. My aim for our blog is to impart relevant and interesting information to you in regards to the latest and greatest in the dental design world. However, we’ve got so much going on at the moment that my head is full of work, work, work. So, forgive me if I just do a quick ‘brain-dump’ on all the things we are working on currently. 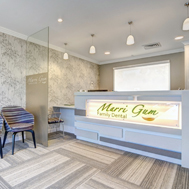 Brand new surgery (southern suburb of Perth) – we completed the space planning, colour consultancy and reception and waiting area design a while back. The construction (by Dentpro) is nearly finished (YAY!) and we look forward to getting some photos on the site very soon! Refurbishment (northern suburb of Perth) – again this is another reception area of an existing surgery we designed. The client was not totally happy with the designer they commission, so we were engaged to make some alterations to the existing (recently constructed design) and come up with a new reception desk. Brand new surgery (Perth city) – as you may or may not know, there is HEAPS of construction happenening in and around Perth at the moment. This project is in a new building (which is still being constructed) and the client got the architect of the building to come up with a space plan for his new surgery. Unfortunately, the architect didn’t have any experience in surgery design, so the client came to us for help. We were able to incorporate two extra operatories and a disabled WC (council requirement) and create a much more usable layout for our client. We are currently working on the reception design and colour consultancy. 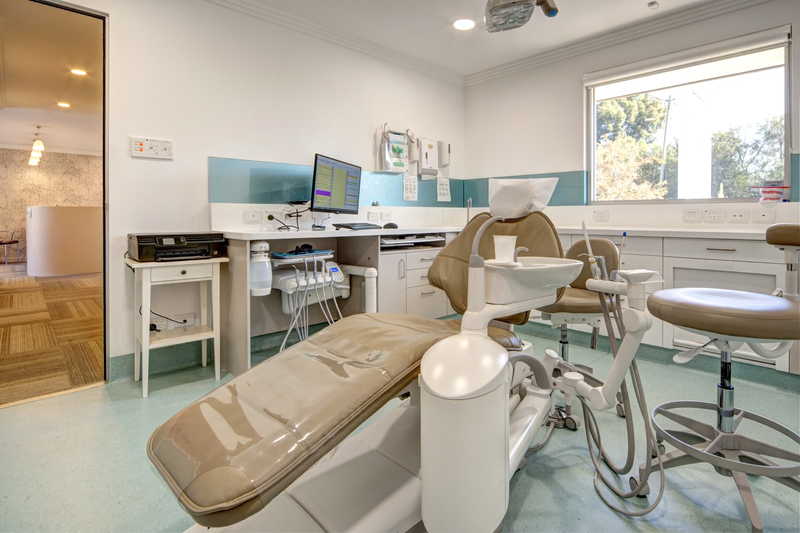 Brand new dental lab (Perth city) – this is a very small tenancy in the same building as above – we did some minor planning for council approval and will be looking at the colour consultancy for this project. Existing surgery (central suburb of Perth) – the partners in this surgery approached us to do a feasibility study for their existing premises. They currently sub lease part of the building and the tenants will be moving in the coming months. They were unsure if they should do minor renovations and extend into the sub leased area or do more major renovations or even add a second storey. I am currently researching all the options in regard to council requirements, cost estimates, building issues and down time required for each option of construction. I’m quite enjoying this type of reporting and look forward to letting you know which way the partners decide to go! So, thank you for indulging me in getting all this down on paper, so to speak! I hope to have some photos of the current projects up on the site soon. Posted by Natasha Posted in Ego Squared projects | Comments Off on Where are we at…?